← Oy Vey! Announcing the short list for the funniest children’s book award! Saturday, April 6th, 2019 | 2 to 4 p.m.
1169 Pinetree Way, Coquitlam, B.C. Eileen’s presentation, reading, and PowerPoint will start at 2:30 p.m. A number of children’s activities will occur both before and after the presentation and refreshments will be available. This humorous but heartwarming chapter book is best suited to ages 7 to 9. “Sophie is thoughtful and funny and full of ideas. When her friend Brayden brings a spider to school in a jar, Sophie’s excited to study it. But then a classmate frees the spider in the Grade 3 classroom. Their teacher, Miss Ruby, is terrified of spiders. 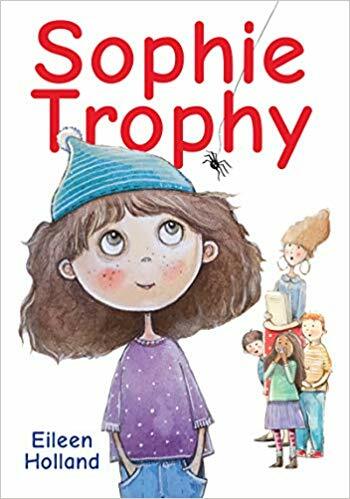 Sophie wants to save her teacher from the eight-legged intruder without getting Brayden into trouble for bringing it to school. That means getting the spider out of the classroom without letting Miss Ruby know what’s going on. This is no easy task, and soon Sophies wacky ideas and wild imagination land her in the principal’s office—and hanging upside down outside his window. This entry was posted in activities for kids, book launches, CWILL BC news & events, literary events, new publications and tagged Eileen Holland. Bookmark the permalink.